"Nuvera is looking forward to work with PNNL and Thermo King to bring fuel cell technology into an entirely new market," said Gus Block, director of marketing and government affairs at Nuvera. "Sysco and H­-E-B are great examples of industry-leading companies that are already taking advantage of the benefits afforded by hydrogen and fuel cell technology." Nuvera's Orion® fuel cell will do the work normally done by a small diesel engine, which keeps food and beverage cargo at the proper temperature while the tractor trailer is making deliveries. 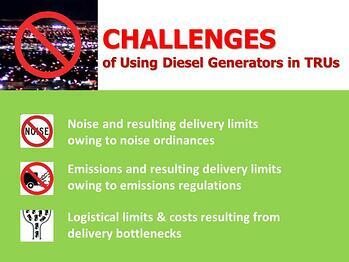 The Energy Department-supported demonstration will be conducted by Sysco Corp. and HEB Grocery Company (H-E-B), both based in Texas. Quiet operation and zero-emissions from the TRU mean that grocery trucks will be able to make deliveries at any time of day, without creating noise in the neighborhoods they serve or adversely affecting air quality. "This is a great application for a fuel cell," said Kriston Brooks, the PNNL scientist leading the project. "A transport refrigeration unit traditionally is powered by a small diesel engine or electric motor that drives compressors to cool the cargo. 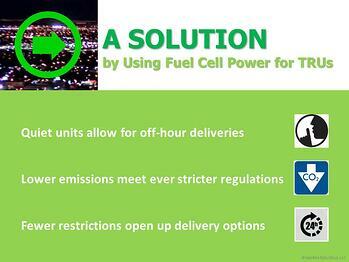 A fuel cell can provide a clean, quiet and efficient alternative by powering the electric motor." Nuvera is working with Thermo King to develop the fuel cell-powered TRU. The refrigerated trailer will run for at least 400 hours while supporting each demonstration site, delivering goods from the distribution centers to stores or other outlets. The truck will make deliveries for a Sysco food distribution facility in Riverside, Calif., and for H-E-B's food distribution center in San Antonio, Texas. Both the Sysco and H-E-B facilities already use forklifts powered by fuel cells, an emerging trend in the material-handling industry. The infrastructure used to provide hydrogen for the fuel cell forklifts is already in place at both demonstration sites and will also be used to provide hydrogen to the fuel cell-powered TRUs. The hydrogen is generated on site from natural gas and water using a Nuvera PowerTap® hydrogen generator and refueling station, to provide an uninterrupted hydrogen supply to fuel cell-powered equipment. 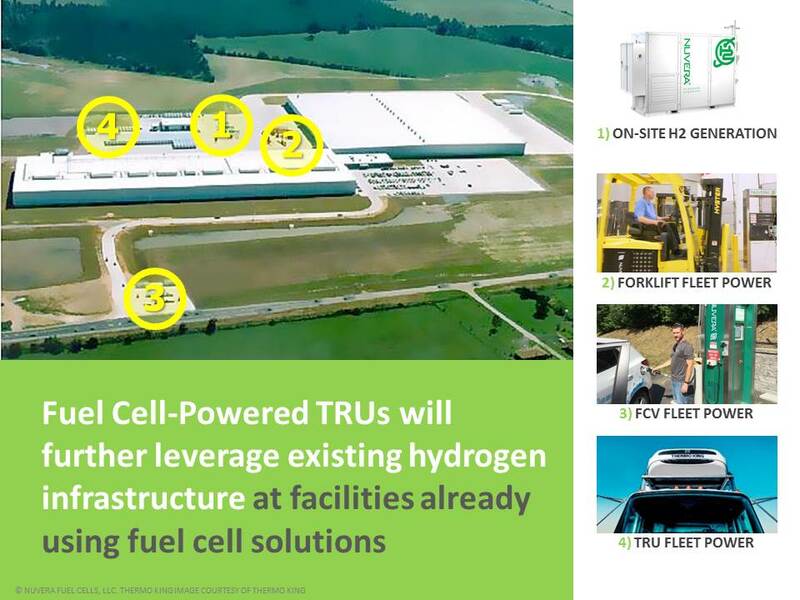 Refueling time for the fuel cell-powered TRU will take no longer than for conventional diesel-powered refrigeration units. Interdisciplinary teams at Pacific Northwest National Laboratory address many of America's most pressing issues in energy, the environment and national security through advances in basic and applied science. PNNL employs 4,500 staff, has an annual budget of nearly $1 billion US dollars, and has been managed for the U.S. Department of Energy by Ohio-based Battelle since the laboratory's inception in 1965. For more information, visit the PNNL News Center, or follow PNNL on Facebook, LinkedIn and Twitter (@PNNLab and @energyPNNL).